A simple-to-use, cost-effective new fire-extinguishing device is being introduced to the local market by Fire & Security Techniques of Centurion. 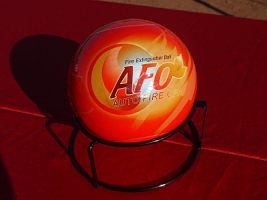 The FST Fire Orb is a unique self-activating, portable fire-extinguishing device that activates automatically when in contact with open flames. The FST Fire Orb is effective for use against all types and classes of fires, from electrical shortages to fat, oil, and paraffin stove fires, vehicle fires, and workshop and factory fires. The FST Fire Orbs can be wall-mounted for maximum effectiveness, explains Fire & Security Techniques CEO Neil Hughes. Each FST Fire Orb weighs only 1.3 kg, making it lightweight and easy to handle and operate. It consists of a lightweight case of frangible material, with a protective exterior sheathing. The internal cavity contains a pyrotechnic detonator at or near the centre of mass. It is activated by fuse cords extending to the surface. The device is filled with mono ammonium phosphate, a non-conductive dry chemical powder, which means it can be used on any electrical product without resultant damage. The detonator incorporated in the FST Fire Orb is a small, non-lethal explosive mechanism. The force of the bursting device is non-harmful to humans, animals, or property, and the effect is minimised further by the use of low-density, low-mass components. This means no part of the device has sufficient mass or density to constitute a ballistic hazard, or result in concussive shock. The FST Fire Orb activates automatically upon direct contact with open flames, and not heat. Upon activation, it emits a loud bang of between 119 dB to 138 dB as a warning signal, and disperses the dry chemical powder in order to extinguish the fire. The device is simply rolled or thrown into the fire, whereupon it activates within three to seven seconds. The FST Fire Orbs have passed tests conducted by the PSB Corporation and Sirim Qas International for Class A, B, and C fires. Additional tests carried out include thermal resistance, burst effect, sound level, compression resistance, and drop tests. The devices are regulated and certified in accordance with ISO 9001: 2001. They have also been approved and classified by the South African Police Service. “We offer a free risk-assessment service for all clients interested in the product, whereby our risk-assessment manager advises suitable installation requirements pertaining to customer specifications,” Hughes highlights. Fire & Security Techniques demonstrated the Fire Orbs at the City of Tshwane’s Winter Awareness Day in the Kopanong Informal Settlement on 14 June. “One of the many applications of the new technology is fire prevention in informal settlements,” Hughes points out. These not only have a high risk of fires, especially in the cold and dry winter months, but often lack the necessary firefighting equipment and skills. In this regard, the company is also championing its own Fire Heroes programme to promote fire-prevention awareness, and to assist in generating employment opportunities in local communities.